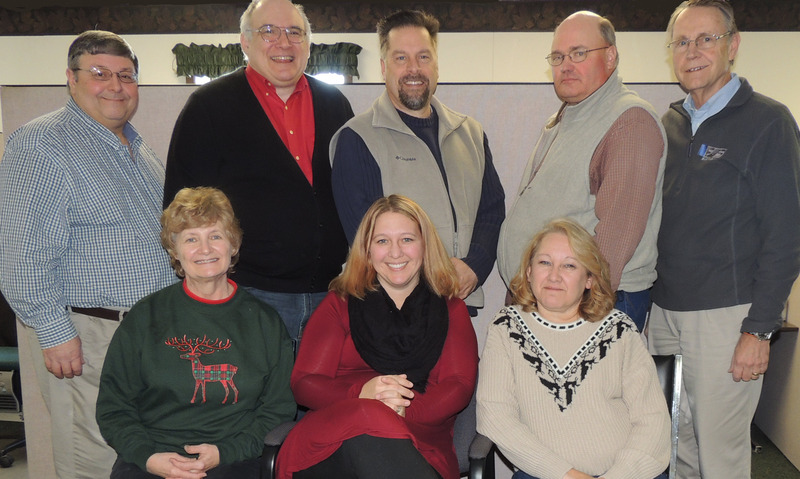 Merry Christmas from our "farm team" to yours. We sincerely appreciate the opportunity to serve you--agriculture's top managers--in 2016 and look forward to helping you prosper and grow in 2017. Our team is committed to not just coding cutting-edge integrated software but to also providing you the technical and accounting support to be successful. Please don't allow the hustle and bustle of the seasons distract you from worshipping Christ the risen and reigning King! Computers on the Farm Conference. Farm Industry News explores dashboards. The power of FBS comes from our exclusive integrated design that multiplies your efficiency and effectiveness. Now you can save money as you power up your software. Purchase new FBS modules--such as Scanner Interface, LifeCycle Budget, Crop Audit or the MACH 2 Field Data Interface--and save 10% if you pay by December 31. 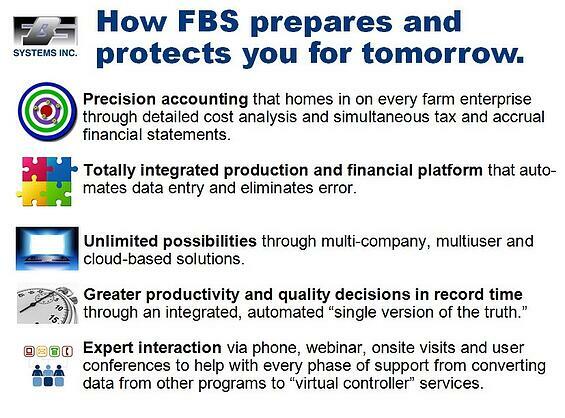 Call 800.437.7638 or email sales@fbssystems.com for a quote. Attention livestock producers: As of January 2017 all antibiotics that are “medically important” will need a Veterinary Feed Directive (VFD) which is written statement issued by a licensed veterinarian in the course of the veterinarian’s professional practice that orders the use of a VFD drug or combination VFD drug in or on an animal feed. This document, which is shared by veterinarian with the feed mill and the producer, is written for flow and site with a specific order for the number of days and head of livestock. VFDs expire in 6 months expiration (unless otherwise specified). Scanned PDFs of the VFDs can now be linked with Smart Feeder Groups so they are available for instant recall through the latest Scanner Interface update. 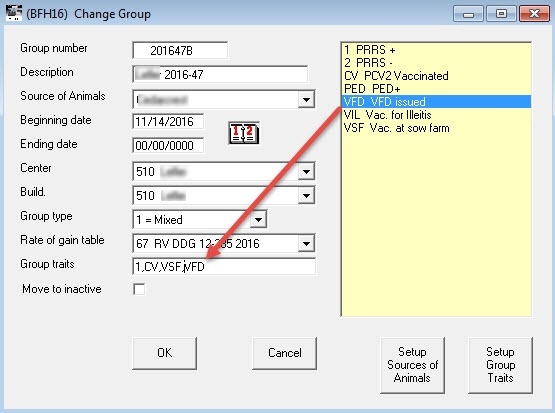 Groups that have been issued VFDs can also be tagged using the User-Defined Trait field. Feeding User-Defined Reports can then be filtered by the VFD Trait field. 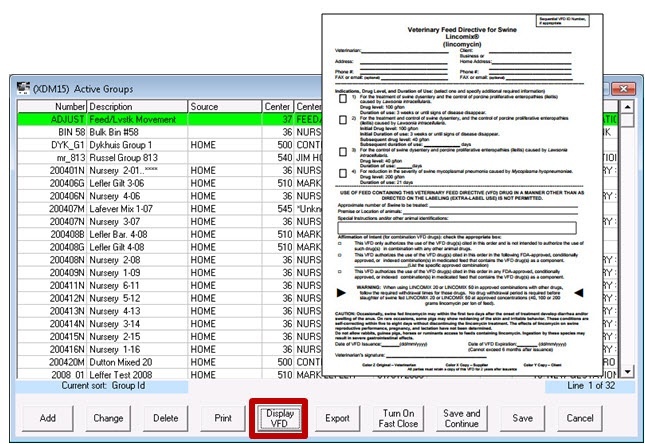 Premise ID referenced in VFDs is stored with feeding locations which are referenced through Groups and can be displayed in User-Defined Reports. What's required for you to be VFD ready? Smart Feeder with Group Tracking. 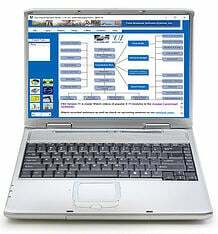 Scanner Interface (which can also be used to store accounting transactions). For more information call FBS at 800.473.7638 or sales@fbssystems.com. Orders placed December 31th will qualify for a 10% discount. FBS users from across the Midwest are invited to gather at the "granddaddy" of ag computing events, the Computers on the Farm Conference sponsored by the University of Missouri at the Tan-Tar-A Resort in Osage Beach, Missouri on January 13-14. In addition to demonstrations and discussion of computer technologies for farm applications there will be a break-out session specifically for FBS Users. The first process in transforming your historical accounting records into opportunity accounting is standardizing/normalizing your data. Organizations such as the National Pork Board, the Farm Financial Standards Council and various farm record associations have done a good job laying the groundwork with concepts of standardized units, management segments and production stages. This month we’ll look at another sub classification: production cycle. Unlike all other “manufactured” products agriculture is governed by biology. While crops and animals grow and produce miraculously and genetic selection and management practices have dramatically increased their productivity, they are ultimately constrained by fixed seasons and gestation cycles. Crop year. For annual and perennial crops this is the calendar year in which harvest occurs. Costs may have been incurred for this year’s crop in prior years and sales may occur in future years so it’s important not to intermingle crop years. See example above. Multiple harvests. Hay is usually harvested in three or more cuttings per calendar year, often with reduced yields in later cuttings. Multiple cropping. This occurs when more than one crop is grown on the same field in the same growing season—for example, double-crop soybeans planted in wheat stubble. Because of the later planting it’s exceptional for double-crop soybeans to yield as well convention single-crop soybeans so they are often identified as a separate production center. Calf crop year. With a 283-day gestation cycle, beef cattle production is fixed at one calf crop per year. Lactation cycle. In dairy cattle, however, the goal is to extend the calving interval beyond a year so lactation cycles can be stretched to 22 months or more. Turns per year. Confinement livestock feeding operations use this metric to evaluate asset turnover. Weekly flow. All decisions on sow farms are coordinated to hit weekly total head wean targets. 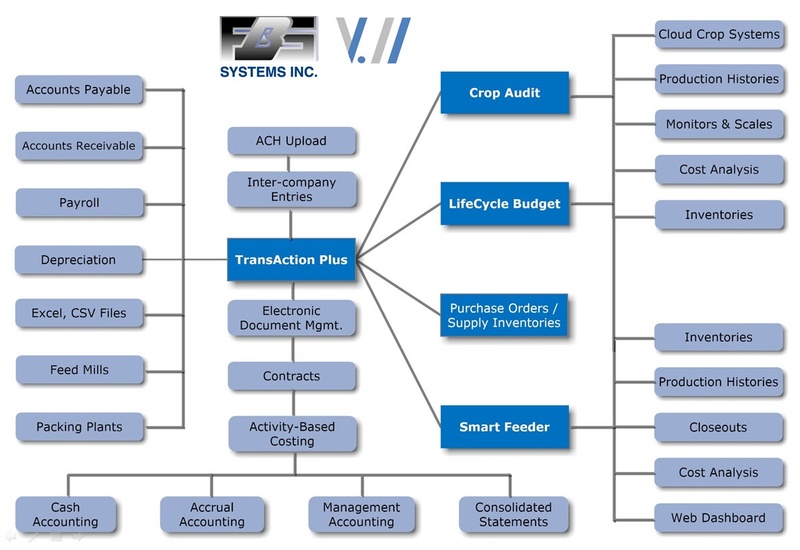 How are these production cycles useful in opportunity accounting? They allow the grouping, standardizing, annualizing and ranking of disparate production activities with the goal to make better-informed and objective decisions. Next time we’ll study the ownership sub classification. Northern Iowa producer and 2012 Top Producer semifinalist Tim Richter recounts his experience expanding his operation in Missouri in the December 2016 Farm Journal Top Producer's story, "Find a Business Partner--Stay savvy and inquisitive while growing through mergers, acquistions and more." Ohio's Bryant Agricultural Enterprise was featured in two farm magazines this season. The November 2016 Corn Soybean Digest article "Data science: judge land per bushel" emphasized the Bryant family's practice of evaluating full production costs across all farms. They are also early adopters of Granular. The Mid-November Progressive Farmer story "Insure Your Margins" describes how the farm is testing the new Production Cost Insurance product. 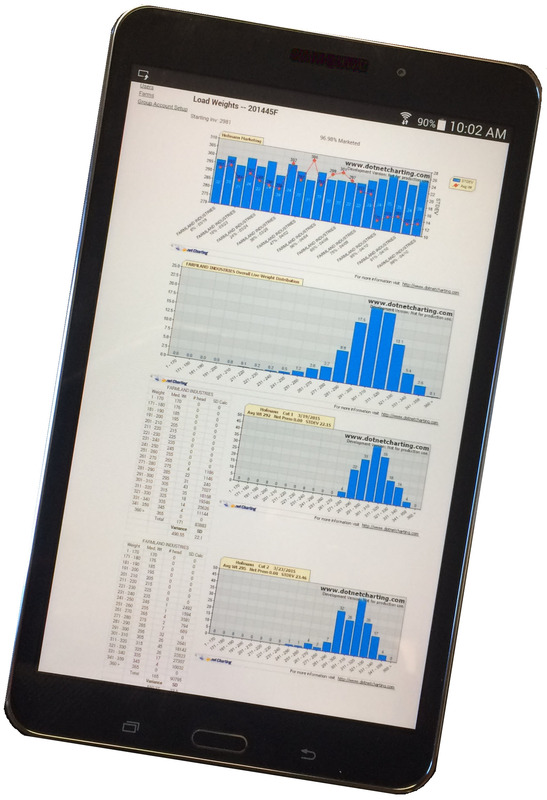 Willie Vogt describes the benefits of data dashboards in the December 2016 Farm Industry News. FBS is an innovator in offering web-based dashboards that are concise, clean and current. Learn more about our acclaimed Pork Profit Center dashboard by clicking here. January 9: Understanding the terms "Integrated" and/or "Linked" in FBS. January 16: Differences between Companies and Divisions. January 30: Understanding the Utilities menu. Q. Why aren't my checks being automatically numbered anymore? A. There was a small issue with this in early 2016 that was fixed with an update to the program. 1. Go Utilities>Check for Updates to correct the issue in the program. 2. 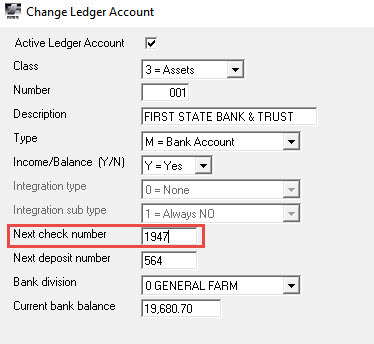 To restart your auto check numbering again go to Setup>Accounting>General Information and make sure the correct boxes are checked for Auto Check Numbering and click Save. 3. Then go to Setup>Accounting>Ledger Accounts and find your bank accounts (they are most likely Class 3s) and highlight the account you want to update and click Change. Find the window near the bottom and enter the Next check number and click Save. Keep in mind that if you record computer checks with a different numbering sequence than hand-written checks that the numbering will update sequentially from the last number used so you might have to reset your numbering between the computer checks and hand checks!